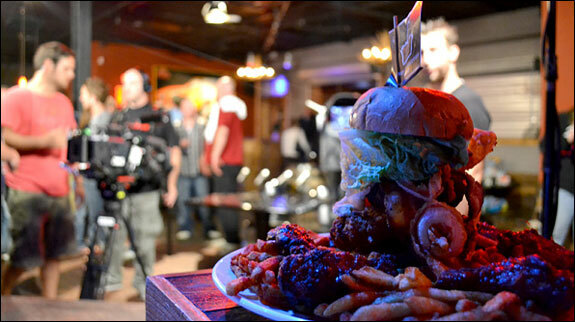 Last night on Man v. Food Adam ventured out to Boise, ID to take on the Johnny B. Goode challenge. This challenge consists of 3 different parts, the first part is a ridiculous cheeseburger topped with a hot dog and pastrami, the 2nd part is a large order of chili cheese fries and finally wash it all down with a large milkshake. 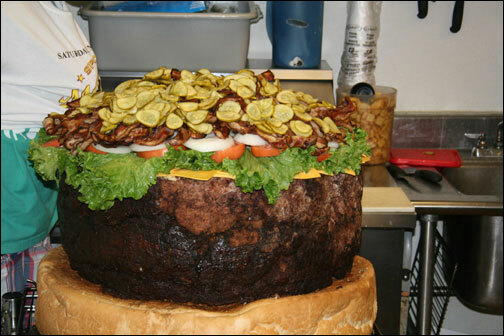 And in order to complete the challenge you must finish all of this food, all 6.5 pounds of it, in under a half an hour. If you are successful you get to take home a brand new Fender guitar (or at least Adam did, there’s not much info elsewhere on the web). Rules: None mentioned, but be sure to ask your server before attempting. But there’s limited hours when you can take the challenge. It’s $19 I tried it the other day I was in pain! I could only do the burger and shake! how many people have won? It’s $18.99 and you don’t get a guitar. That was just for the show. You get a tshirt and your pic up on their wall. oh.. and it has a 95% failure rate! says so on the menu. p.s. The amount of food really is a ridiculous amount. It’s 6 lbs of food total (including the 16 oz) shake. My friend and I were not even close and another guy in the restaurant threw up at the table when he was just a few bites away from finishing. Sorry that was me. I didn’t throw up, I accidentally pooped in the booth. It was my fault as I had just finished eating some oysters and Lucky Charms right before the challenge. I was so embarrassed because I was on a first date (she broke up with me by the way), but they gave me a tablecloth to wrap up in, and I ran out of the restaurant. Unfortunately the smell never came out of my car (Fiat 500). I tried to donate it, and they threw me out of the donation center and told me they’d call the cops if I ever came back. The challenge was actually a blessing in disguise, as I was later diagnosed with IBS, and no longer eat oysters and Jagermeister.